Apple Inc. is the world’s most famous smartphone maker. After slipping to the third position as the world’s largest smartphone manufacturer, losing its 2nd position to Huawei, the company is putting in all of its efforts at regaining their position from the Chinese giant. In order to fulfil this wish, the company launched three different iPhones on September 12 - the iPhone 8, iPhone 8 Plus and the iPhone X. The iPhone X the special edition iPhone that marks the 10th anniversary of the launch of the iPhone by Apple in 2007. The phone is said to be among the best iPhone models ever imagined and created at the company’s R&D center. Apple iPhone X "OLED Display"
The iPhone X is different looking than the iPhones that we have seen so far. The phone will have an array of sensors on the front panel, on either sides of the speaker. The volume control and power buttons is placed on one side, and the dedicated silent switch on the other. There's no fingerprint sensor and the phone instead uses face recognition technology that can recognise the face of the user in all conditions. On the back, the phone will have a Dual-lens camera module, aligned vertically, with the Apple logo at the center of the back panel. Rest of the back panel appears to be more or less blank. The phone measures 143.6 mm x 70.9 mm x 7.7 mm and weighs 174 grams. The display of the iPhone X is expected to be OLED type bezel-less edge to edge display. Whether or not it will be curved like the Samsung Galaxy S8 is not revealed. The size is 5.8 inches across diagonally, and is protected ion strengthened glass. The top panel will have mulitple sensors that will enable to phone to make a note of the face of the owner by scanning contour points, eyes and other unique features a human face has. Apple has claimed that the probability that some else can unlock yur phone by trying to impersonate is 1/1,000,000, making it practically impossible for anyone else to unlock the phone, even if using a mask. The OLED display offer an amazing contrast ratio of 1,000,000:1. Apple iPhone X "A11 Bionic Chip"
Apple’s devices are always great at performance. With amazing coordination between software and hardware, there are never any instances of lags and glitches. The iPhone X is powered by the A11 (possibly Hexa-Core) chip set built on the 64-bit architecture. The device has 3GB of RAM under the hood with 64GB/256GB storage options. The storage, as usual will not be expandable. The phone will be running on the latest iOS 11 that was revealed some time ago. Also, the iPhone X will carry just one SIM card slot, which will accept a nano SIM. Other than that, there would be no slots for any other cards. The phone will of course be 4G supportive and will conform to 4G VoLTE standards and will support all network bands. With the best in industry features and massive upgrades to the existing features, the iOS 11 is the best operating system a phone could run on. The camera of the iPhone X is a sight to behold. The phone sports a 12 MP + 12 MP (f/1.8 & f/2.4 dual lens), that will allow for 2x optical zoom, 5x digital zoom and a total of 10x zooming allowed. Apple Inc. has a long history of producing phones with the best of the cameras. Surely the phone will give you a great capture of images and memorable moments. The camera will obviously be capable of what other iPhones are capable of. It will have features such as simultaneous image and video capture, Noise reduction, geotagging (both image and video). The front camera has been dubbed as the TrueDepth Camera and will have a resolving power of 7 MP with a f/2.2 aperture value, AF and face detection features. The front camera will take beautiful selfies in a wide angle so that everyone in the group is captured in the photo. Apart from that, the front camera will be capable of replicating facial expressions in real time, snap or record them in the form of customisable and animable emojis (called 'Animojis') and send them as message over the iPhone. The TrueDepth Camera is capable of much more than any other front camera in the entire smartphone world. On the video recording part, the iPhone X’s camera will be capable of 4K video record @ 24/30/60 fps, 1080p video record @ 30/60/120/240 fps. The front camera will record Full HD 1080p videos @ 30fps. For multimedia, the phone will support all the popular audio and video formats. Apple has once again ditched the 3.5mm jack in all the new iPhones. So you'll have to rely on the lighting to 3.5mm converter for listening to music. Also, you cannot charge your phone and use the wired earphones simultaneously. The best course of action would be using AirPods. 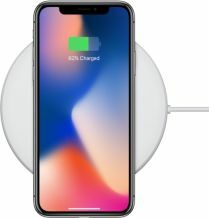 Apple iPhone X "Wireless Charging"
iPhones have never been good at providing great battery backups. The iPhone X is no exception and hosts battery that will last the day on light usage. Apple says the phone's battery provides a talk time of 21hours on 3G networks and upto 60 hours of mmusic playback. With these battery specs, You’ll have to carry your charger around. Interestingly, Apple was rumoured to be planning to introduce the USB-C into the iPhone X. However, that turned out to be false alarm, and we still have the lighting connector. The phone will support wireless charging as well as fast charging; with charge capability of upto 50% level in 30 minutes. On the connectivity part, the Apple iPhone X will be connecting to wireless networks using the IEEE 802.11 a/b/g/n/ ac protocols. The phone will also have a Bluetooth v4.2 or later hardware (will not be able to transfer files to other operating systems though), GPS w/ A-GPS, GLONASS, BeiDou support for navigation, will support 4G LTE, 3G HSPA and 2G EDGE bands in UAE. 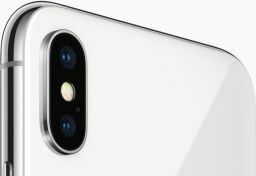 The iPhone X has a Backside illumination sensor, Face ID, Barometer, Three-axis gyro, Accelerometer, Proximity sensor and an Ambient light sensor. With the wide range of sensors, the iPhone X will be a great device to work with. The true advantages and disadvantages of the phone are balanced out. However, the expert review inclines towards favouring the phone completely. It can connect to 4G LTE conforming to VoLTE networks. iPhone X also supports 3G HSPA/UMTS and 2G EDGE/GPRS cellular networks. Apart from that the phone can connect to wireless networks compliant to IEEE 802.11ac networks. Apart from the new iPhone X handset, things you will get in the box are: EarPods with Lightning Connector, Lightning to 3.5mm Headphone Jack Adapter, Lightning to USB Cable, USB Power Adapter and Documentation. No. The phone only supports a single nano-SIM card. The connectivity options present in the device include Assisted GPS, GLONASS, iBeacon micro-location, Galileo, QZSS, Digital compass, Bluetooth v5.0, NFC with reader mode and Wi-Fi Mobile data. What are the sensors provided in this device? The sensors of iPhone X are : A True-Depth Camera (for Face ID), Barometer, Three-axis gyro, Accelerometer, Proximity sensor and Ambient light sensor. What OS is present in the phone? The iPhone X will come with latest iOS 11 pre-installed and will have some exclusive features. What accessibility features are present? Accessibility features help people with disabilities and the features include are : VoiceOver, Zoom, Magnifier, Siri and Dictation, Switch Control, Closed Captions, AssistiveTouch, Speak Screen. What unique security features are provided in the iPhone X? The iPhone X comes with new Face ID feature to unlock the phone and it supports one face per device. Does the device have IP68/IP67 certification? Yes, the new iPhone X features IP67 water/dust resistance. It can survive underwater for 30 minutes at a depth of 1 metres. Does the device have wireless charging support? Yes. It is the first device launched that has the support of wireless charging(works with Qi chargers) from apple family. With this feature, the device can charge 50% power in 30 minutes. Tell me about the device's battery? According to Apple Inc., the device’s battery will last up to 2 hours more than the previous model i.e iPhone 7. Also, on cellular networks, the talk time is up to 21 hours, video playback is up to 13 hours, audio playback is up to 60 hours. What physical buttons are present in the iPhone X? Talking about external buttons on the device, on the left panel, there are 3 buttons - Volume Up, Volume Down, and a Ring/Silent key. On the right, is the power button (activates Siri, powers off, and locks). At the bottom, there is a USB lightning connector port for charging and music. What are the phone’s dimensions? The dimensions of the device w.r.t Height x Width x Depth are as follows 143.6 x 70.9 x 7.7 mm. Which chipset is the device powered by? The all-new Apple’s A11 Bionic chip of 64-bit ARM-based system, an SoC with a 6-core CPU is installed on the iPhone X. Talking about the primary camera specifications of iPhone X, on the back panel, the main lens has a 12MP sensor with an f/1.8 aperture wide angle lens, while the secondary lens has a 12MP sensor with f/2.4 aperture telephoto lens. It also features Dual OIS (Optical Image Stabilization) and optical zoom and digital zoom up to 10x. Yes. The device is capable of recording 4K video at speed of 24 fps, 30 fps or 60 fps. It also has optical image stabilisation(OIS), Optical zoom, and 6x digital zoom for video. The device weighs about 174 grams. The smartphone has been launched in 2 memory variants i.e 64GB and 256GB internal storage, with 3GB RAM. The Apple iPhone X has a beautiful 5.8-inch all-screen OLED Multi-Touch display. The device has the resolution of 2436 x 1125 pixels, making it the highest-density screen on any iPhone. iPhone X comes with 2 colour options to choose from i.e Space Grey and Silver. The base variant(64GB) of iPhone X costs you around 3699 AED, whereas 256GB model price is around 4199 AED.